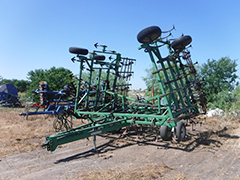 Buy and sell used and unused Cultivators at IronPlanet. Cultivators are typically pulled behind an Agricultural Tractor. These pieces of farm equipment are commonly used for plowing and cultivating fields, while they can also be used to root weeds inbetween rows. Browse Rodweeders and other Cultivator models from top manufacturers including John Deere Cultivators, Morris Cultivators and others. Find IronPlanet and Ritch Bros. Auctioneers' current Cultivator inventory below, and see what Cultivators are for sale around you. Browse IronPlanet's full auction schedule.